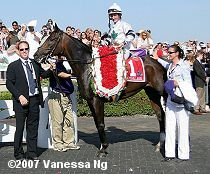 The $1 million Arlington Million (G1) is the highlight of the Chicago racing season. 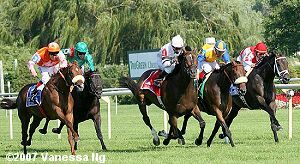 The first million-dollar stakes race in racing history celebrated its 25th running this year, with a field of seven top turf specialists going 1 1/4 miles over the lawn at Arlington Park. Despite hot sunny weather, the course was listed as "good" after heavy rains earlier in the week. Last year's winner The Tin Man was sent off as the lukewarm 2-1 favorite coming off a close second in the American Invitational Handicap at Hollywood last out. 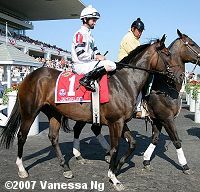 In to challenge were 5-2 second choice Sunriver from the powerful barn of trainer Todd Pletcher, winner of the Bowling Green Handicap at Belmont, and 4-1 third choice Danak, shipping in from Ireland for owner-breeder The Aga Khan off a fourth place finish in the Tattersalls Gold Cup at the Curragh. Down the stretch with Jambalaya starting to take the lead from The Tin Man with Doctor Dino on the far outside.? When the gate opened, jockey Garrett Gomez sent Sunriver to the front to set a very slow pace of 26.34, 50.88, and 1:16.15 while The Tin Man and regular rider Victor Espinoza stalked him just a length off the pace in second and 8-1 Canadian invader Jambalaya just behind him in third, saving ground around both turns under new rider Robby Albarado. Sunriver stubbornly held onto the lead into the stretch but The Tin Man had come out wide and put in his rally, taking over the lead with 3/16 of a mile to go. The Tin Man looked homefree but Jambalaya, who appeared to be boxed in early in the stretch, found running room at the 1/8 pole, came through and wore down The Tin Man late to prevail by 3/4 length in a time of 2:04.76. It was just a nose back to late-running 5-1 Doctor Dino in third, while Sunriver and 15-1 late closing Stream Cat dead-heated for the fourth spot. 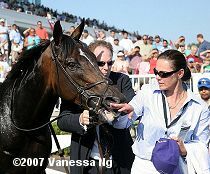 Jambalaya in the winner's circle with co-owners Todd Phillips and his wife and trainer Catherine Day Phillips. 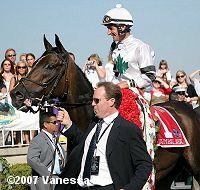 Phillips is the first female trainer to win the Arlington Million and Jambalaya is the first Canadian-bred horse to win. 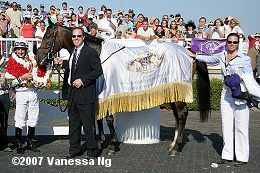 Jambalaya with his winner's blanket and the trophy presentation. 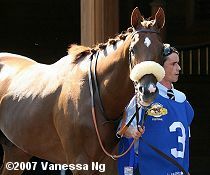 His trainer and co-owner Catherine Day Phillips said, "Yesterday we walked the turf and put our hands into it and they went right into it. It was definitely bottomless yesterday. Today, we went out there again and it seemed a lot better. I had really dried up a lot and they had also cut the grass, so we ere a lot happier this morning. We figured he would be sitting right off the pace, very similar to the races he ran at Gulfstream sitting on the inside just off the pace. He ran when it was time to." Jambalaya heads out for the post parade. His jockey Robby Albarado said, "She (Day Phillips) gave me very specific instructions. He breaks really sharp. I figured I'd try to stay behind The Tin Man. He let me have my way and at every point in the race, he was there for me. He's a great ride and I'm proud of him. 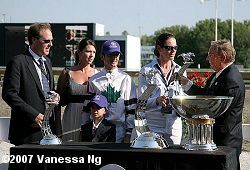 It's always been my goal to win the Arlington Million and now it's one that I've accomplished." Second place finisher and beaten favorite The Tin Man in the post parade. 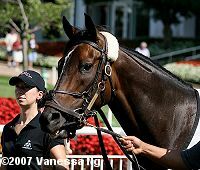 His trainer Richard Mandella said, "I'm proud; as proud as I can be. The only little bit of disappointment is I like to think he could make history, but there's no disappointing days with The Tin Man. He did the best he could, looked like he had it won, and one ran him down. I thought he had it at the 1/8 pole." 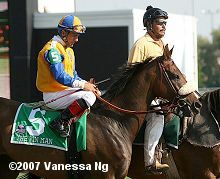 His jockey Victor Espinoza said, "He ran awesome. He's a very talented old horse; he likes to run, and he's just unbelievable. The turf is a little soft for him, but even then he tried really hard. We hooked up at the 3/8 with the other horse, and they put out a lot of extra effort when they go head-to-head. The last 20 yards, he was feeling it! If the turf had been a little more firm, I think he could have won it." Third place finisher Doctor Dino in the paddock. 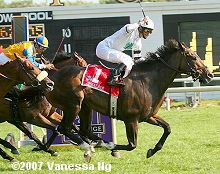 His jockey John Murtagh said, "We were in second, finishing well, staying on the line, but (The Tin Man) was just a tad bit better. (Doctor Dino) kept fighting but we were never going to beat the winner." Jambalaya schooling in the paddock on Friday afternoon while trainer Catherine Day Phillips looks on.